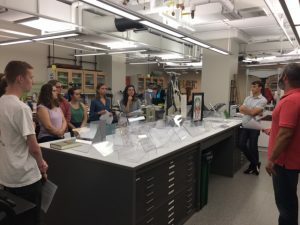 The class discusses book cradle design with Alessandro Scola (right) at the Department of Conservation and Preservation at Johns Hopkins. 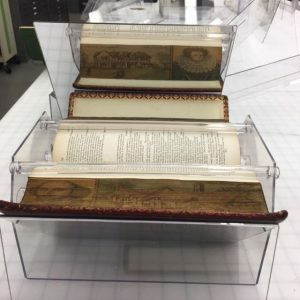 Prototype fore-edge book cradle with mirror to display split painting as designed by Senior Book Conservator in the Departmet of Conservation and Preservation at JHU, Alessandro Scola. We are grateful to the many people who contributed to our successful realization of this project. We wish to extend special thanks to the Knott Family, Kim Bannister, Kyle Bauer, Sarah Espinosa, Andrea Hall, Chris Lonegan, Molly McGath, Mark Pollei, Barbara Preece, Heather Raedeke, Alessandro Scola, and Matthew Treskon.